Lil Boat has partnered with the brand to design new capsule collections and appear in brand campaigns. big announcement coming soon! Right @nautica ? 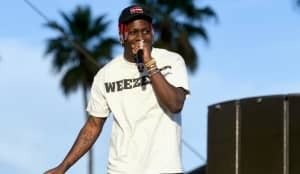 Nautica announced on Friday that they have partnered with Lil Yachty for upcoming capsule collections and digital and social media campaigns, WWD reports. The announcement follows the Atlanta rapper's role as the face of Nautica's collaboration with Urban Outfitters in November. Speaking to The FADER in December, Yachty discussed his love for the heritage brand. "Another thing that was amazing was to get noticed by Nautica, because I had been pushing to get their attention," he said of his successes in the past year. "I was wearing 100 percent Nautica for months. I was wearing Nautica everything. I still wear Nautica a lot. I just wear a lot of other stuff too. But the Nautica lookbook came through, and we have a lot of future business in the works." The 19-year-old has previously credited his nautical leanings to the brand. Along with the announcement on Friday, Nautica enlisted Lil Yachty to curate a limited-edition collection of pieces that includes rereleases of popular vintage items from the brand. Watch The FADER and Lil Yachty's Keep Sailing short film. Thumbnail image: Petra Collins for The FADER.